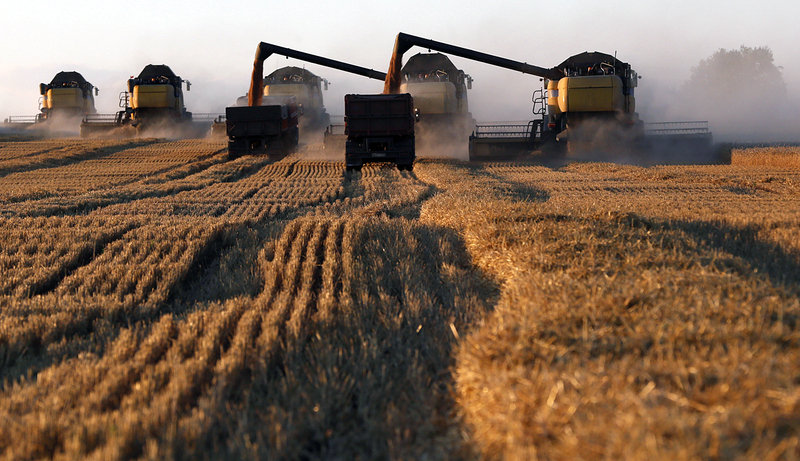 Combine harvesters work on a wheat field of the Solgonskoye farming company near the village of Talniki, southwest from Siberian city of Krasnoyarsk, Aug. 27, 2015. Russia may start wheat supplies to Venezuela already in early next year if the sides agree on technical aspects and sign a respective agreement, Russia’s agricultural watchdog, the Federal Service for Veterinary and Phytosanitary Surveillance (Rosselkhoznadzor), said on Dec. 5. "Taking into consideration Venezuela’s high interest in importing Russia’s wheat, the export of Russia’s wheat to Venezuela’s market may begin already in early 2017 if the authority agencies of both countries agree on technical aspects and sign this agreement," Rosselkhoznadzor said in a statement. In early October, Rosselkhoznadzor said Russia could begin wheat supplies to Venezuela before the end of 2016. The watchdog already prepared and sent a draft protocol the Venezuelan side. The document concerns safety measures to ensure quality and phytosanitary requirements of grain supplies. According to Rosselkhoznadzor, Venezuela imports almost 100 percent of wheat to meet its needs. The U.S. and Canada are traditional suppliers of wheat to Venezuela. The two countries supply up to 120,000 tons of wheat to Venezuela every month.